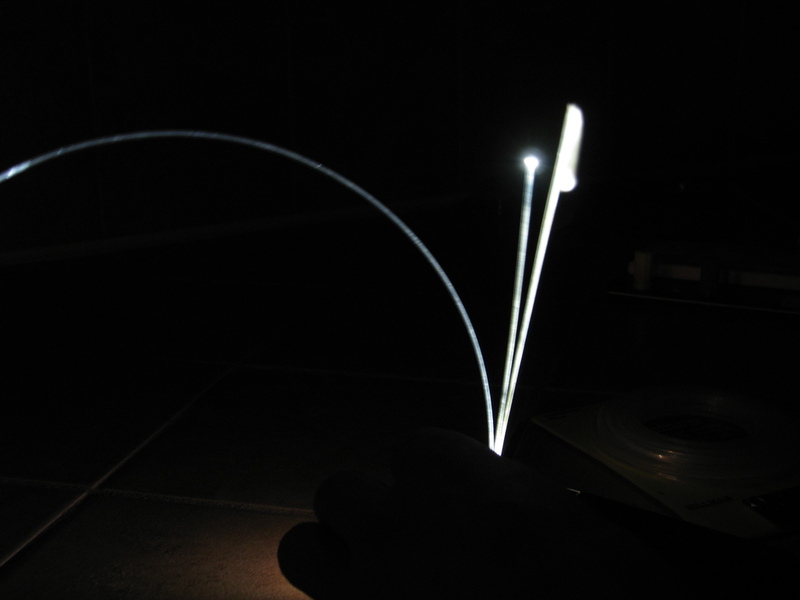 Before we go any further with the actual chandelier build we should go over the basics of the fiber optic filaments. 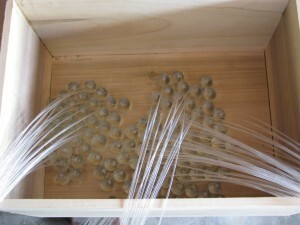 The preferable filaments contain a PMMA core. These in particular offer the best total internal reflection. 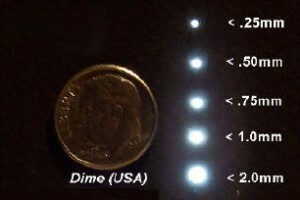 You will notice that the fiber optic filaments come in a few different sizes. Basically the larger the diameter of the filament the more light will be allowed to transfer through it. 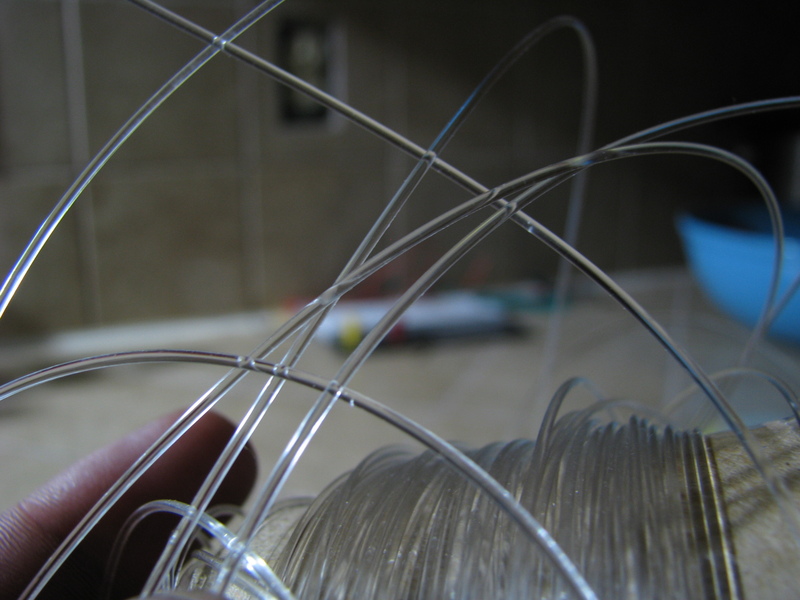 Keep in mind however that even the 0.5mm filaments used in the chandelier are a hassle to position properly. 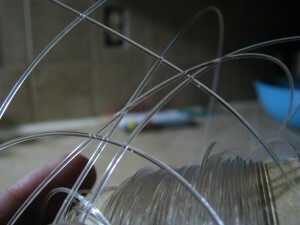 The 2mm filaments will transfer much more light but will have little to no flexibility. 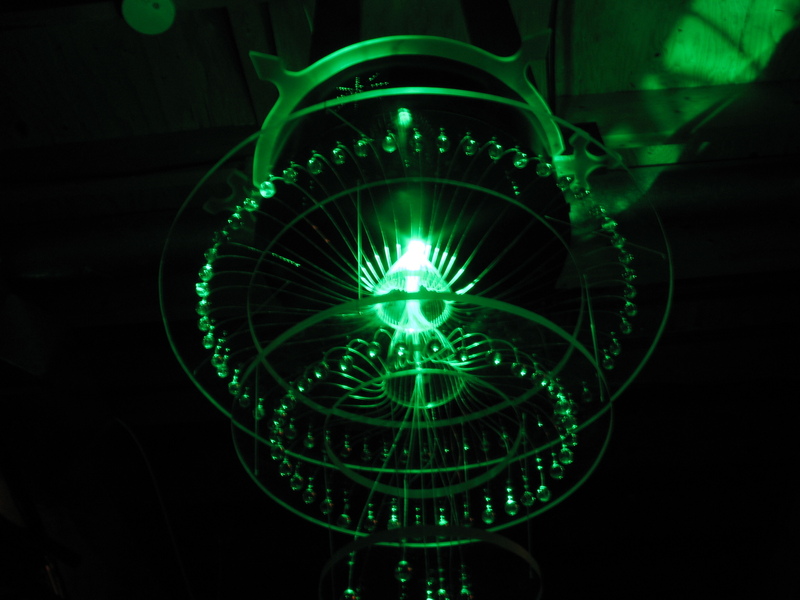 The light source is the heart of your chandelier. There are several options in light sources all of which depend on your needs.For the purpose of this project we will be using a combination method with our own custom made driver. 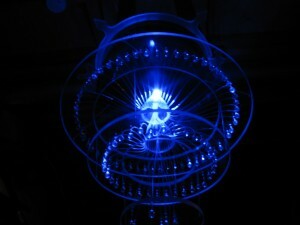 The Combination method uses Red , Green, and Blue LED’s. The color is changed by varying the intensity of each color using PWM to simulate a change in the voltage. The diffuser can be created with anything that will disperse light throughout itself. 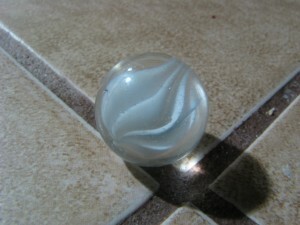 Glass, Plastics, and crystal are just some of the materials that can be used. 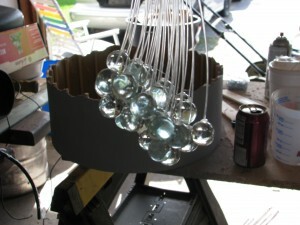 This particular project used clear marbles as the diffusers. They were cheap and accessible. However they also very difficult to work with due to their lack of weight combined with them being spherical and glass offered no good way for fastening the filaments. Version 2 write up will discuss a more effective method of mass producing quality diffusers on the cheap. 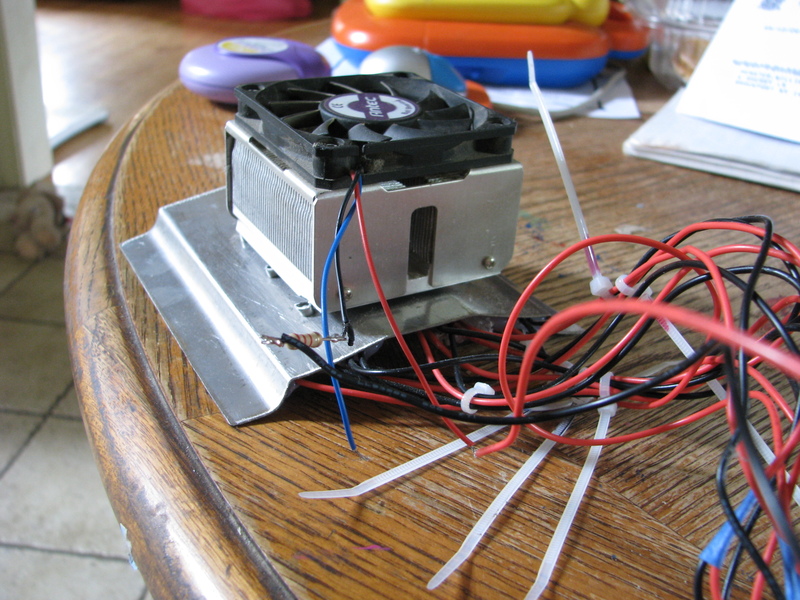 electronic parts. 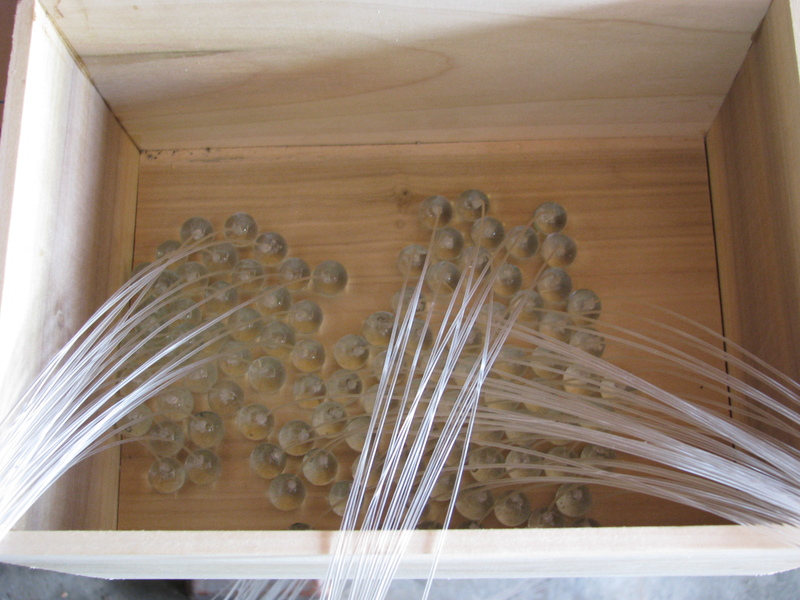 The filaments (with diffusers attached) are fished through the guide holes within the acrylic rings up to a center hole that leads into the “base”. 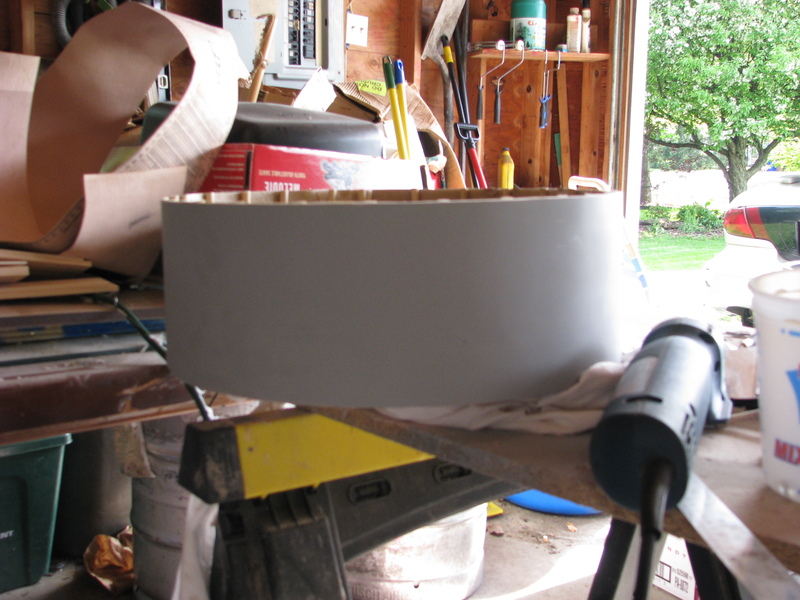 The base for this project was made using fiberglass and acrylic. I do not recommend this. Even for the more experienced user this becomes a hassle. For a better, more thought out design can be found on Version2. If you do plan on creating a multilevel chandelier I would suggest using a 1/16″ stainless steel woven cable with aluminum stops, versus the acrylic hanging wire which is seen on this prototype.
.:LED Driver and Wireless Control Board:. 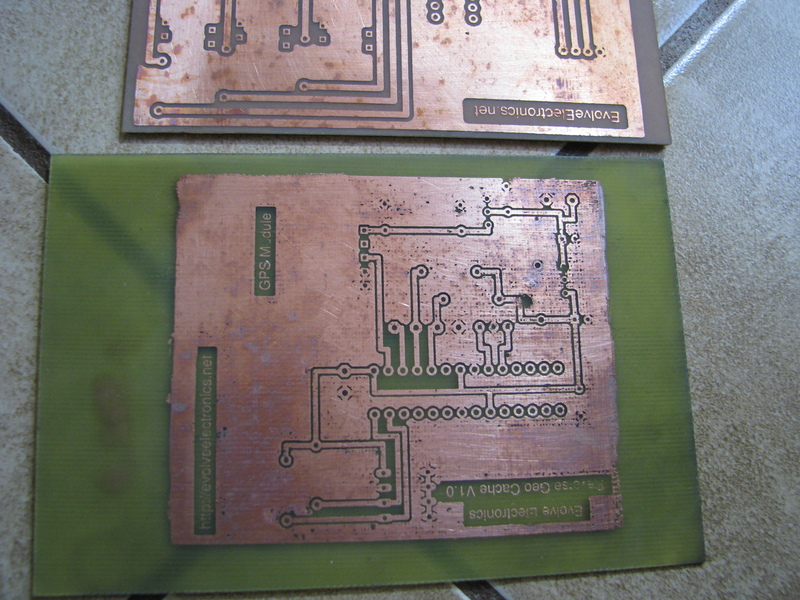 For this particular project a custom board was created using the toner transfer method. 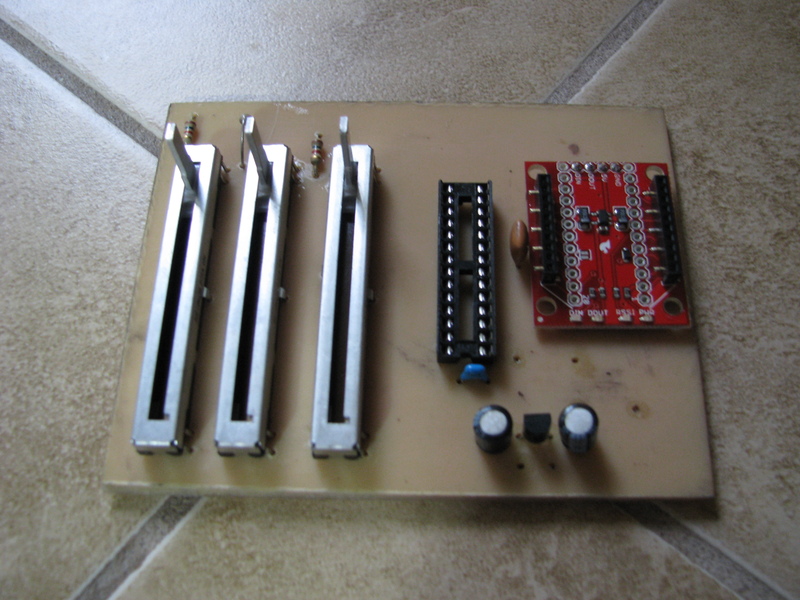 The board design is fairly simple. 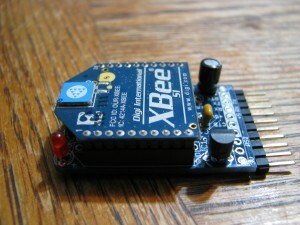 The board receives commands from another custom made control board via a wireless connection established using Digi\’s Xbee modules. 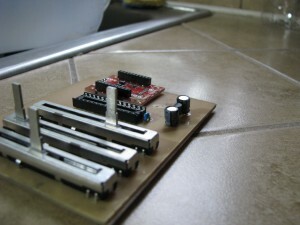 Once the commands are received from the controller an ATMEGA-328P is used to run the gate of a Mosfet with a PWM signal. This will allow you to vary the intensity of the LED’s.You can find the Eagle files and the code within the code-bank, as well as a more detailed explanation of each. 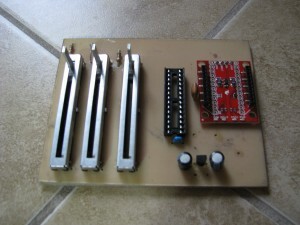 The controller board consists of an ATMEGA328p –overkill, and 3 sliding potentiometers. Each pot controls a different channel. One for Red, one for, green, and one for blue. 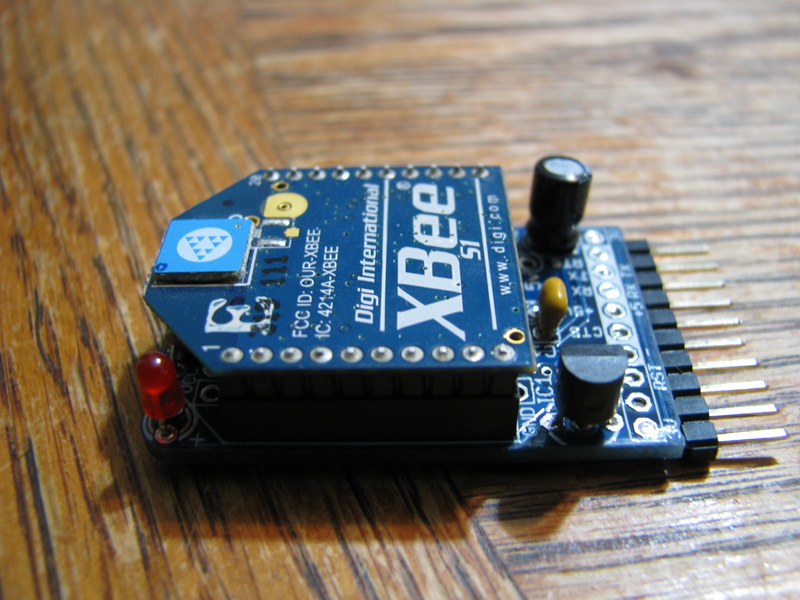 The controller uses the same Xbee transceiver to broadcast the data packets. 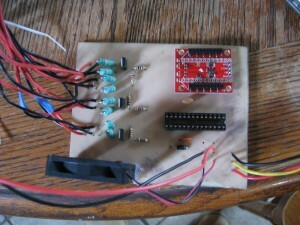 Note* there may be an issue with the slider pot schematic and board design. It would seem that the sensitivity of the pot is limited to about 10% of its sliding distance. 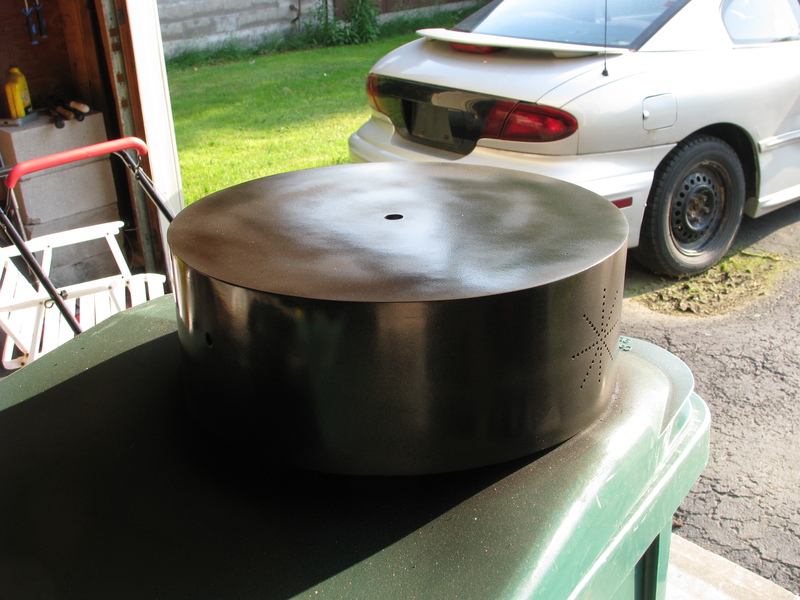 meaning, the lights do not fade gradually in relation to the pot, rather they turn on bright after a 1/2″ of sliding then only brighten slightly for the remaining distance. I am positive this is a wiring issue. diffusers they could not be placed in a way that made them visually pleasing. The video also shows some discoloration of the filaments when all LED’s are lit. 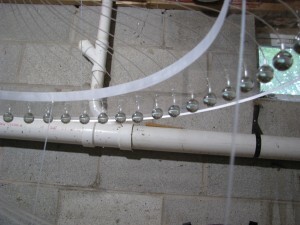 This was resolved by adding mirrors that were sand blasted to diffuse the light and bounce it around before it entered the ends of the filaments. 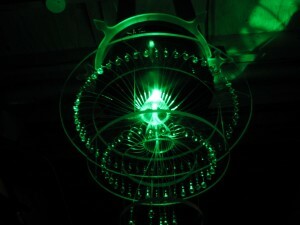 Inside Fiber Optic Chandelier Prototype from Apex Logic on Vimeo. 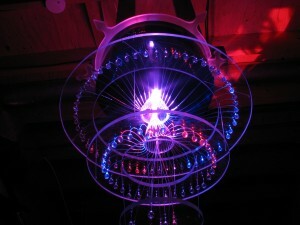 Fiber Optic Chandelier Prototype from Apex Logic on Vimeo. 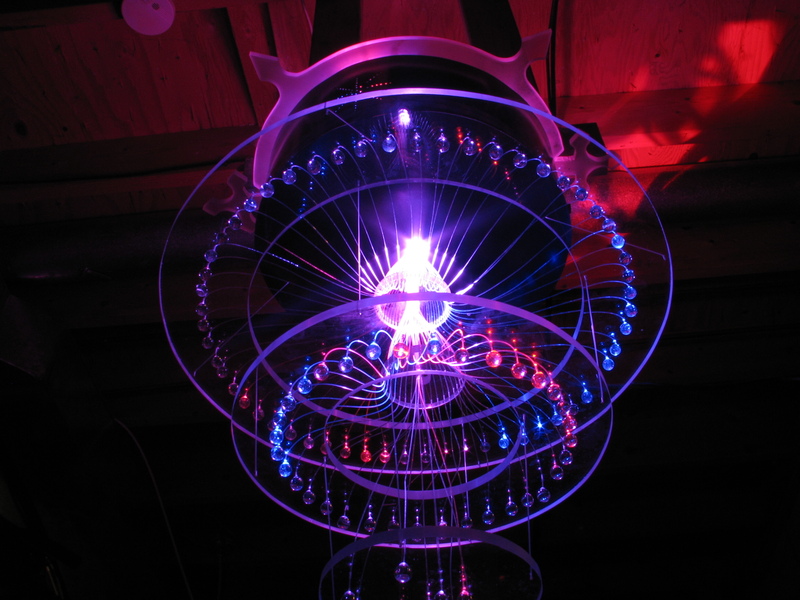 Fiber Optic Chandelier Prototype by Bill Heaster is licensed under a Creative Commons Attribution-NonCommercial-ShareAlike 3.0 Unported License. 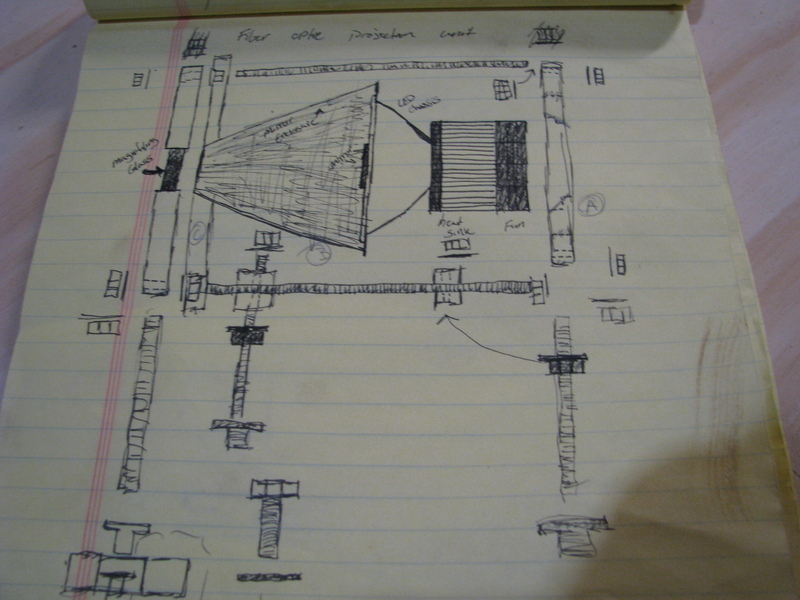 I am a Optical Engineer and have been doing Glass Voice, Data, and High Resolution Fiber for over 18 yrs. I was working with the company Lumenyte International working on Fiber Optic Illumination for about 5 years.We chose to utilize the LED as apposed to the Light Source, due to its loss of it being remote. I think your project need not have macro bending caused by what ever you used to collect the fiber in the middle. I am also curious why you are not using end lit as opposed to side lite for the carriers? I know everyone can do it better, and I don’t want to seem that way the project caught my eye (anything with Fiber Optic usually does) and I wanted to comment. I have very limited experience in the optics field. I am a stone mason by trade. This was more of a spontaneous project based on something I saw on the internet. I will be honest, a large amount of your post is incomprehensible. Perhaps a different translating utility? I chose to use the end glow fiber vs the side glow due to price. If i knew i would be doing another version of the chandelier I may have ordered side glow fiber seeing as how you have to buy a full spool (~$300). 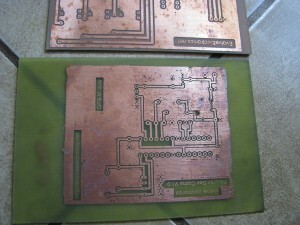 The standard end glow filaments can be sanded to offer a subtle side glow (as you may have already known). 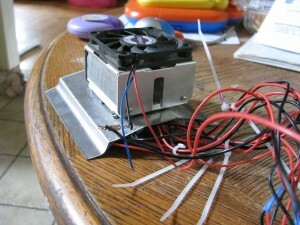 Design was also a factor in ordering the filament. The idea was to transfer as much light as possible into the diffusers. 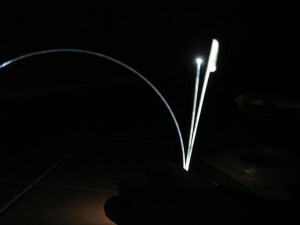 End glow filaments were the solution to this. The LED’s were causing problems dispersing the light because they were two far apart and their angle of emission was to small. 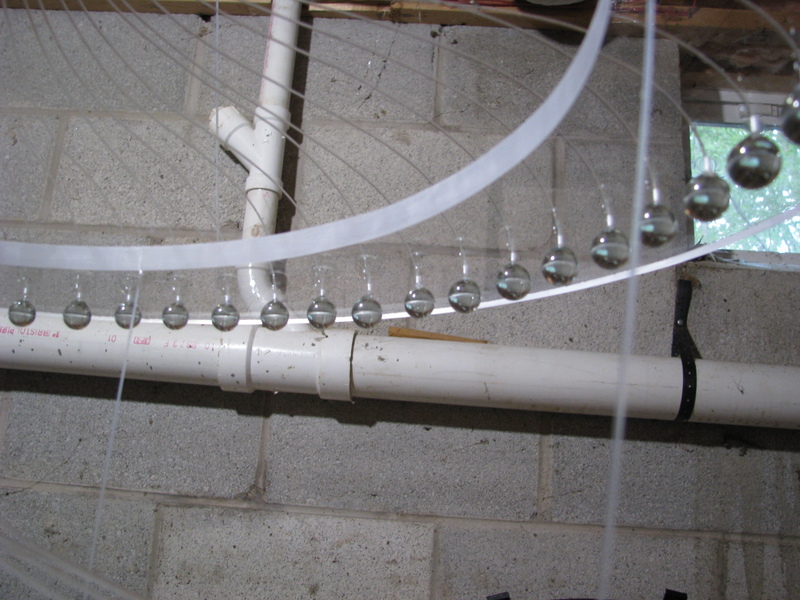 To rectify this problem I have designed a frustum with sanded mirrors that will disperse the light within itself before it is collected by a magnifying glass and focused onto the ends of the filaments.